What's New in Acne Therapy? 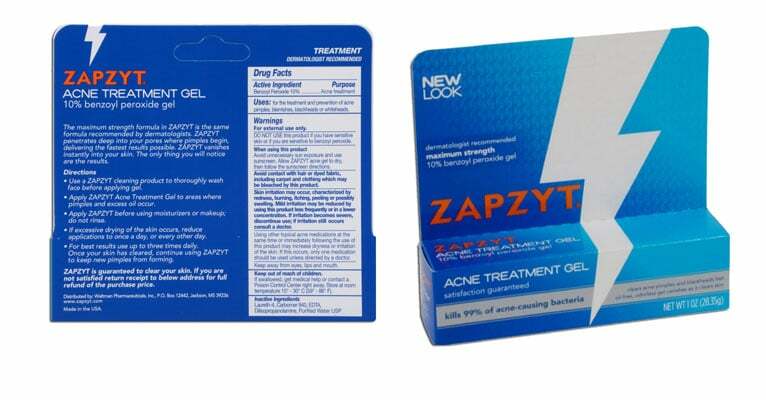 Zapzyt, one of the newer acne products, is great for emergency pimple treatment. Let’s start with a look at acne products that may be new to you and move on to the latest in acne devices. Some of the best acne therapy treatments and devices are also the most affordable. Most devices that cost more than US $1000 are a rip off. Zapzyt 10% benzoyl peroxide gel, selling for just US $5, is great for emergency pimple treatment for teens. Adults over the age of 25 usually need a gentler formula. Paula’s Choice exfoliating toner is a great remedy for blackheads caused by back acne. Acne often leaves brown spots on skin that has brown or golden skin tones. Dermadoctor Immaculate Correction is a safe skin lightener for these skin types. Mineral makeup can protect sun-sensitive skin while it is healing from acne, as well as smoothing the matte of the skin. The challenge in choosing mineral makeup is finding shades that match natural skin tones. The Clinique Oil Control Mask can be just the thing for reddened skin. A tiny hand-held acne treatment light that retails for US $34.95 may work as well as a larger device that retails for $799.99. An at-home oxygen bar, however, is not likely to do your skin any good. For just US $5.29, you can’t find a less expensive way to treat nasty pimples breaking out on clear skin. This product is intended as a spot treatment for pimples. It’s really too strong for most people to use on most of their skin most of the time. But if you are a teen who has a big date or a photo opportunity just a couple of days away, it may be exactly what you need to get a pimple under control so that it can be concealed for your big event. Teens can use this product for facial acne. Adults over the age of 25 should reserve it for pimples that break out elsewhere on the body, especially the back. Take precautions to avoid bleaching fabric or hair. Retailing for US $18.99, this product is great for loosening blackheads anywhere on the body without causing inflammation or irritation. It is especially useful for back acne on any type of skin and for blackheads on the faces of people who have oily skin. If you don’t have a partner who will help you with your back acne, put this toner in a spray bottle for treating back acne. The 2% salicylic acid content of the product will also smooth the matte of the skin and relieve redness and inflammation. Don’t use on rosacea. Hydroquinone is the most commonly recommended skin lightener. It takes out discoloration caused by age spots, freckles, and healed acne blemishes. It can leave African-American skin too light, however, and in some people of Asian ancestry it can cause black and blue discoloration of the skin. This product lightens skin with azelaic acid, rather than hydroquinone, making it safe for people who have Asian skin or African-American skin tones and also for people who have rosacea. Some skin care experts recommend combining this US $81.00 product with tretinoin topical treatments, such as Retissa or Renova. But if your only concern is skin lightening, that’s not necessary. Just be sure to use sunscreen as recommended to make sure you do not inadvertently cause new brown discoloration of the skin while the product is doing its work. Mineral makeup is usually overhyped and overpriced, but it can be very useful for smoothing out the texture of the skin and protecting treated skin from sunlight that cause spots and other kinds of discoloration. Minerals in powder makeup block harmful rays of the sun and allow the skin to heal while it is being treated for acne. The challenge in choosing pressed mineral makeup is finding the shade that best matches the natural tones of the skin. Jane Iredale offers shades that work for brown skin, and cost about three times as much as the Pürminerals product. (The Jane Iredale product contains a sifter that protects the powder from dumping out during travel, so it could actually work out to be less expensive than competing brands.) The less expensive the product, the more titanium dioxide it contains, and the more it will leave a white or purple cast on the skin. This US $20 product is a great way to soothe acne-prone skin. It contains a small amount of salicylic acid, at the wrong pH to break up tight skin around blackheads, but in sufficient concentration to remove redness from the skin. It also contains chamomile extract, aloe, and algae, to relieve inflammation. It will get best results on dry, sensitive skin, but it also will work on oily skin. It’s a little pricier than the most of the cleansing masks you will find at Walmart or the Dollar Store, but inexpensive enough that most people can use it occasionally. Most blue and red light acne treatment systems cost US $199.99 to $799.99. Here is a product that costs just $34.99. Consisting of a small lamp you hold up to your face, the New Color Ray Photo Rejuvenation Therapy Photon Led Device provides the blue light that kills acne bacteria and the red light that reduces sebum production in pores. The disadvantage of this device is that you have to hold it to your skin, whereas you can simply sit down in front of a more expensive acne treatment lamp. Neither this lamp nor more expensive acne therapy devices will help you if you have rosacea. Just because an acne therapy system is new and expensive does not always mean it works better. This US $1,295.00 personal oxygen system is advertised as helping rejuvenate muscles and skin with 50% oxygen. What promoters of the system overlook is that free radicals of oxygen cause inflammation, not relieve it, and that unless you happen to be on a tour of Machu Picchu or Tibet or you have a chronic pulmonary obstructive disease, your body can get plenty of oxygen from the atmosphere on its own.